Classic Summit Chase home on preferred home site (adjacent to Board of Regents of NMSU land)! Offering 4 spacious BEDROOMS, 3.5 BATHROOMS, multiple living areas and 4 Car GARAGE. Originally the personal home of a prominent, local builder. Dramatic architectural detail featuring a SW contemporary style with curved walls, high ceilings, extensive skylights, glass block and sculpted fireplaces. Window placement designed to capture strong mountain views. Gourmet, country KITCHEN ready for entertaining features wood cabinetry with specialty drawers, built-in Sub-zero refrigerator, Bosch dishwasher, Thermador warming drawer, double ovens, glass-top electric cook top in center island and pull-out pantry. Over sized BEDROOMS...one could serve as an ideal OFFICE with lots of built-ins. MASTER SUITE has luxury BATH and huge, wrap around closet with organizers. East-facing backyard with heated in-ground pool and wrap around patio. 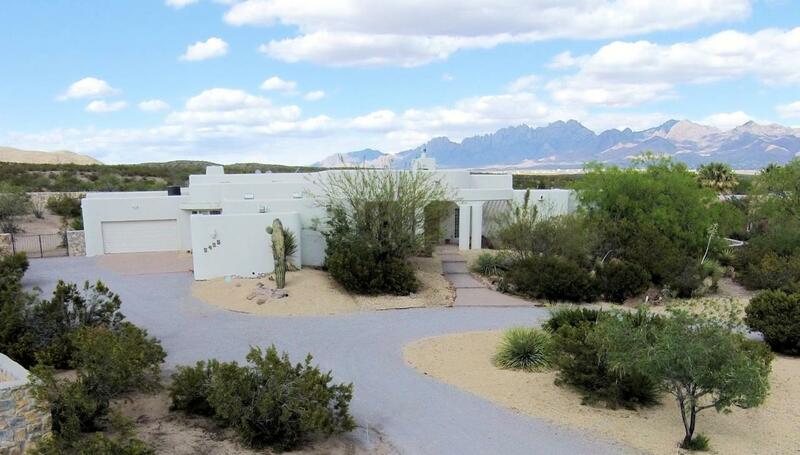 Privacy and views complement this choice Las Alturas property! !